Faced with the adverse impact of economic turmoil and increasing competition, businesses are increasingly looking to differentiate themselves in the eyes of their customers through better brand awareness and capturing the voice of their customers in order to understand what drives their behavior. 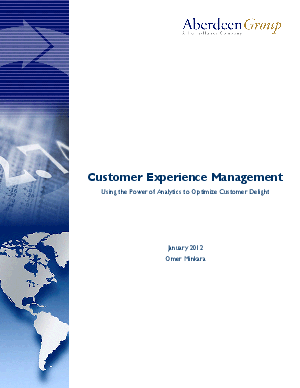 This study captured customer experience management (CEM) adoption trends and performance results through a direct survey of 252 organizations in September and October, 2011. The report highlights industry best practices for establishing and nurturing CEM programs that delight customers while improving overall business results.